A Hong Kong-based Long-Short Hedge fund managing assets across 15 markets was investing in equity, futures, options and swaps. The Chief Investment Officer was looking for ways to enhance the performance of the portfolio. 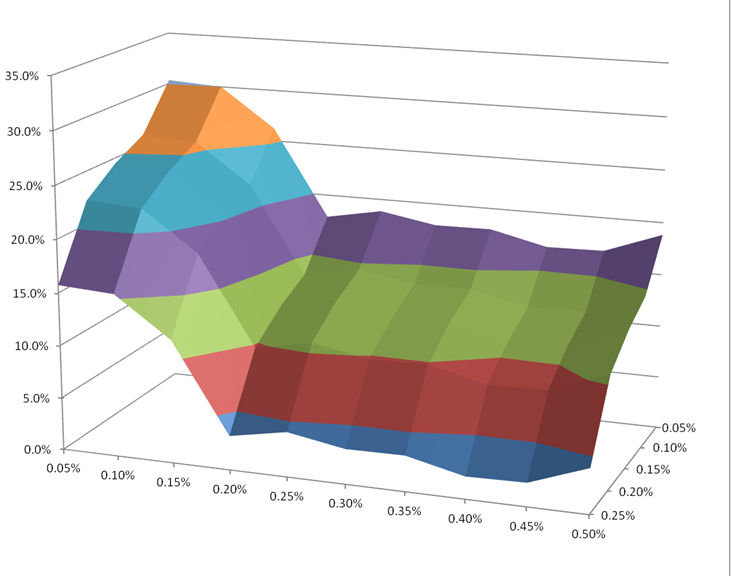 After implementing the standard EFADRIN Performance Attribution module and analysing the performance of the fund since inception it was discovered that, while there had been some extremely well performing positions, there had been a small number of losing positions which had dragged down the overall return. The fund was running a two-tier investment framework split between thematic and tactical positions. All positions are tagged in EFADRIN as one of the two position types at the idea stage so the system contained all the necessary information to conduct an analysis if implementing different stop loss levels. The EFADRIN team developed a automated module which ran a back-test on the portfolio instigating different levels of stop-loss limits for each type of position. These were all hard limits based on percentage of NAV lost by each position. Thematic position limits were tested at 10 different levels from 5 to 50 basis points of NAV. Tactical position limits were tested at 5 different levels from 5 to 25 basis points of NAV. The chart below shows the actual result of the analysis. Thematic stop-loss levels are showing on the X-axis along the bottom of the graph. Tactical stop-loss level are shown on the Y-axis on the right hand side. The Z-Axis show the overall enhancement to NAV in the 18 months since inception. There was a great need for right stop-loss discipline on tactical positions. Since these positions were generally smaller that thematic positions then a loss of 5 bps of NAV already indicates a large loss on a position basis. As the stop loss limit is widened for tactical positions there is a fast and steady reduction in NAV enhancement so the tighter the limit the better. Tight limits on thematic positions also had good portfolio enhancement which dropped off fast from the 5 to 20 bps range. However given the longer term nature of these investment idea it was decided that implementing such a tight limit was not attractive to the portfolio management team. From 20 bps – 50 bps the portfolio enhancement was fairly steady so the investment team decided to use a wider limit for this type of positions. By implementing a 50 + 5 stop loss for thematic + tactical positions overall portfolio enhancement was around 19%, or 12.3% on an annualized basis.